This is a story about a thing I made. I’m still not sure what to call it. Or what it’s really for. This is what it looks like. Or what it looked like when I took this screenshot. It changes. Try for yourself. 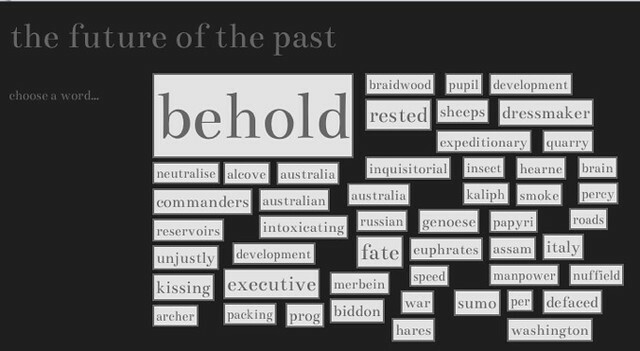 So now I want to create an interface to ‘the future’ of the past using these wonderful words. Can I do it before my public lecture on 8 May? Aaand ‘hitler’ pops up in my tf-idf weighted words in 1937, along with ‘mudguards’, ‘duchess’, ‘opossum’, ‘hollywood’ and ‘canberra’.
.@wragge in fine form at the NLA – on the playful and evocative as ways of doing history, and the virtues of screwing around. Slides from my Harold White fellows talk ‘Mining for meaning’ @nlagovau: http://bit.ly/JblHnY (arrow keys to move). Text & audio to come. 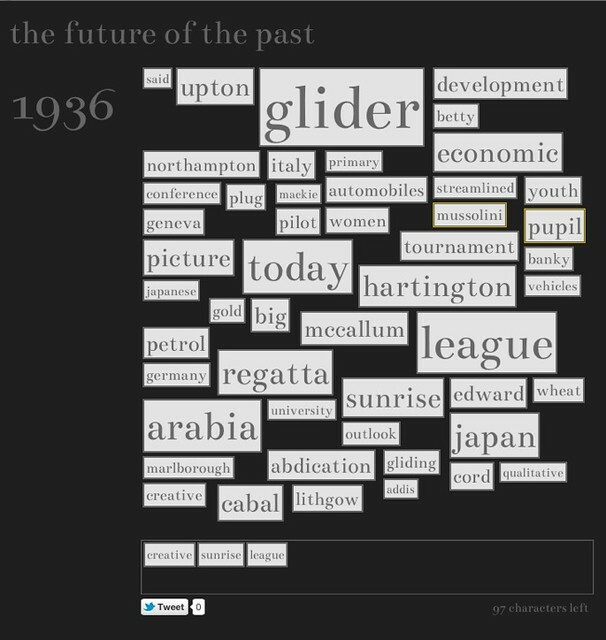 @seth_denbo Playing with using tf-idf weighted words to explore a collection of 10000 newspaper articles containing the phrase ‘the future’. @seth_denbo But I really just like the evocative nature of the word combinations. Will write up some details shortly. @materialculture I’ll write more shortly, but it’s based on words extracted from 10,000 newspaper articles and weighted by tf-idf. BTW – you can reorder the words in your fridge poetry by just clicking and dragging. And you can just click on a word to remove it. @davegearl Just try clicking words until you arrive at a year. The you can click words to read articles or drag to Tweet box to share. @davegearl Just an experiment, but I like the evocative nature of the word combinations. Will write up some details shortly. What is it? Is it a toy? A discovery interface? A work of art? I’m not sure. But I think it’s interesting. This imageis the best description of a stroke I’ve seen yet. I feel like I have been in 404 land for many weeks now! Thankyou for giving me a visual representation of what it means to go to bed one thing and wake up another.with therapy though I am learning to fix all the broken links. Now that I’m out of my stroke rehab I,ve started using this as bit more and it is proving really useful Tim. I especially liked the Melba link which brought up articles I would never have dreamed looking for but am really happy I came across them!